Garnett Wood Products was founded in 1965 with the purpose of providing quality products and superior service. We manufacture a variety of crane mats, pallets, skids, pallet components, boxes, crates, and other specialty wood products. We are a full service wood products company. Whatever the specification, we can meet your needs. 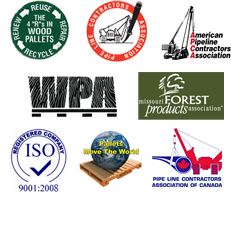 Garnett Wood Products is also a broker for pallets, crane mats, laminated mats, wood fiber, and pallet nails. If your needs involve transportation of wood related products, our large trucking fleet can work with you.